Apple rakes in more profits from its iPhones than all Android phones combined, despite the fact that Android phones command an 81 per cent market share to Cupertino's 12.1 per cent. Earlier this week, IDC reported that Android was used in four out of five smartphones shipped during the third quarter of this year, with Apple, Windows Phone, and Blackberry far behind. On Thursday, however, another report revealed that despite Android's overwhelming market-share lead, Apple's operating margin of 33 per cent enabled it to haul in 56 per cent of all handset profit. 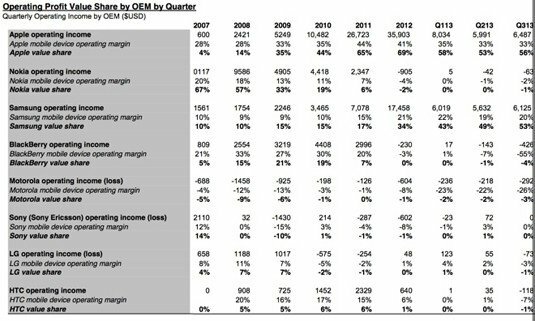 "The latest data from Canaccord Genuity ... estimates that Apple took 56 percent of the operating profits for feature phones and smartphones in the third quarter of calendar 2013," reports AppleInsider. Close behind was Samsung, with 53 per cent of what Canaccord Genuity calls the "value share" of the handset market. Surely you, sharp-eyed Reg reader, immediately noticed that those two figures add up to 109 per cent of the smartphone and feature phone value share, and asked, "How the %$#@! is that possible?" Simple. Most of the competition – Nokia, BlackBerry, Motorola, LG, and HTC – lost money during the quarter. The only other phone vendor surveyed who didn't – Sony – simply broke even. 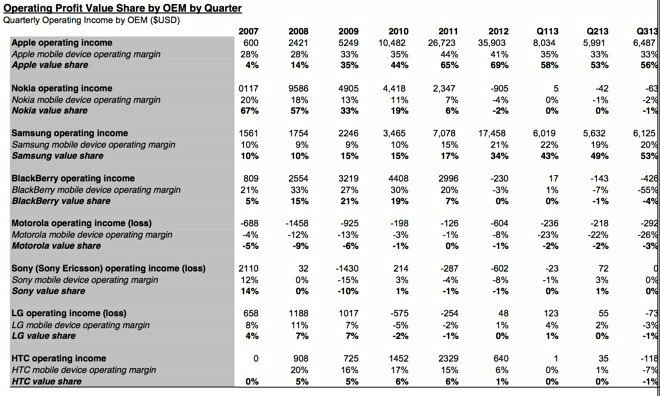 To be scrupulously fair, it should be mentioned that AppleInsider's Cannacord Genuity source told them that Chinese phone folks Lenovo, ZTE, Huawei, and Coolpad were not included in the analysis because their profitability numbers aren't available, and that if those profits – or losses – were factored in, Apple and Samsung's value share would likely be lower. The figures demonstrate two simple facts. First, that in the world of smartphones and feature phones, it's very much a two-horse race between Apple and Samsung – and Cupertino doesn't even play in the feature-phone market. Second, market share does not equal profit share. Not by a long shot. A hefty chunk of those Android phones are cheapo devices with razor-thin profit margins. As IDC pointed out this Tuesday, the average selling price for Android phones is steadily sinking, down 12.5 per cent in the third quarter of this year alone to an average of $317. Prices that low – and that's the average, remember – may grab a lot of market share, but it won't make you a company with the world's largest market capitalization. As of this Friday, Apple's market cap stood at $475.2bn, with number-two Exxon Mobil coming in at $407.2bn. Samsung, by the way, has a market cap of $217.2bn – less than half of Apple's. Apple CEO Tim Cook's focus on the high end of the smartphone market – "We're not in the junk business" – seems to be working.